When you hear “Presidential Library” what do you think about? A small group of exhibits? Perhaps a statue or two? Maybe some framed pieces of memorabilia? 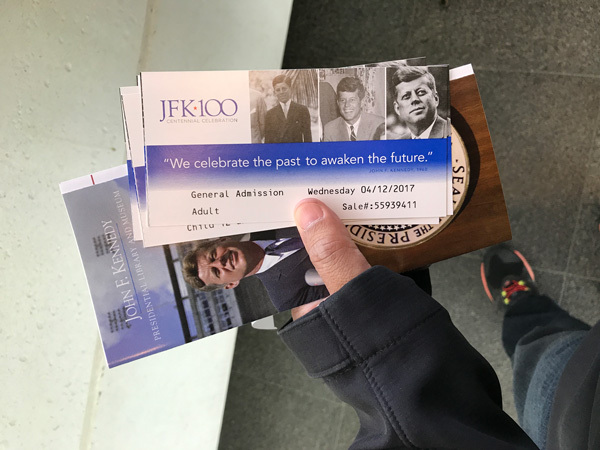 I had very little expectations when visiting the John F. Kennedy Presidential Library. I had never visited a Presidential Library before so I had no measuring stick. But after visiting the Kennedy Library last week, I have a new found excitement to visit more! 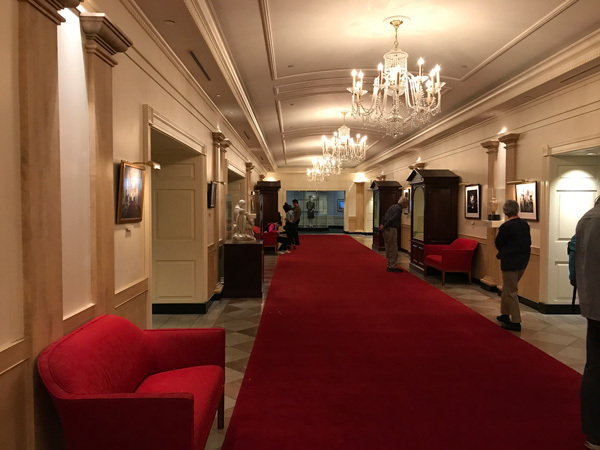 When I was planning our vacation itinerary for the trip to Boston we took last week, I penciled in the Kennedy Presidential Library for a number of reasons. The first reason is despite living in New England for almost 15 years, I had never visited before. The second reason is as far as presidents go, Kennedy is my favorite. Between his Boston roots, his ideas on citizen activism, and his promise to put a man on the moon, I have always been interested in him. That fascination has extended to my kids. Most notably, my son who, in exhibit 1 below, was excited about receiving Kenndy things for his birthday last month! And then finally, the last reason I added Kennedy Library to our itinerary was to have a visit to an indoor place in case one of the days of our visit was a rain out. I know that may seem weird or a bad reason but having an indoor excursion as a flex activity is incredibly useful when planning a jam-packed detailed itinerary! Sure enough, it was overcast and dreary on one of the days so we headed over. This building was beautifully designed by the architect, I.M. Pei. Our whole family couldn’t resist publishing pictures of this gorgeous building. Admission to the Kennedy Library is pretty decent. $14 for an adult and $12 for a teen is super reasonable in this day in age. And the fact that 2 out of my 3 kids qualified for the 12 and under FREE admission was a major bonus! 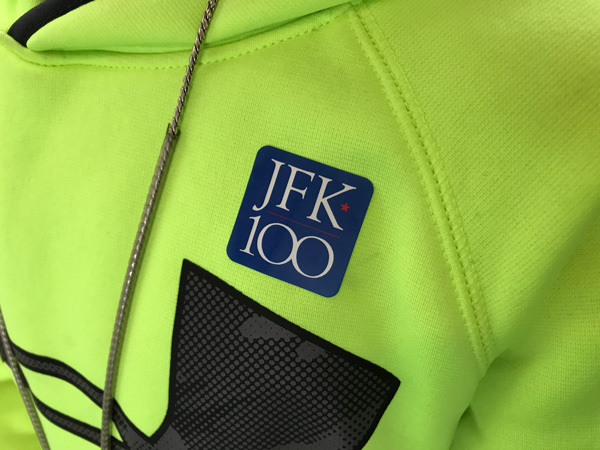 We were given stickers for proof of admission that marked the year-long JFK 100 Centennial Celebration that marks the 100th anniversary of President John F. Kennedy’s birthday. Kennedy was born in Brookline, Massachusetts on May 29, 1917. 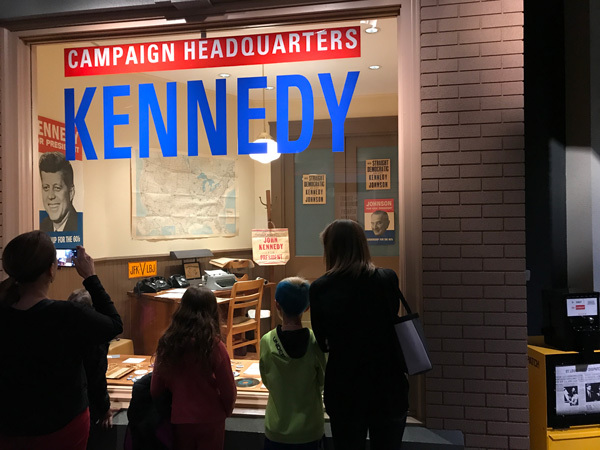 You can visit Kennedy’s birthplace home in Brookline, MA and it is part of the National park Service so you know we were pumped to visit. Unfortunately, the John F Kennedy National Historic Site is closed for the season and won’t reopen until later this week. There is a small display with some interesting artifacts in the first section of the museum called “Young Jack”. 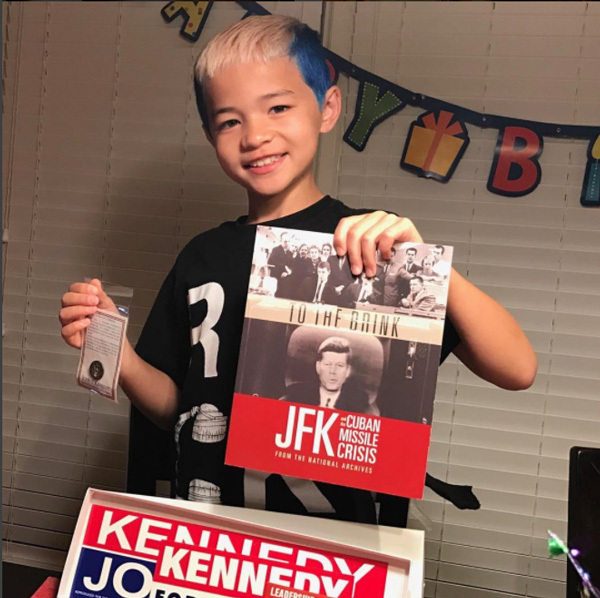 When we walked into the library, my son, the Kennedy-and-all-things-Presidential-history-buff, asked me if I thought Kennedy’s coconut was there. I had no idea what he was talking about. He explained to me the story of Kennedy using a coconut to write a message for help after his boat sank and then he kept the actual coconut on his desk in the Oval Office during his presidency. Imagine my surprise and my son’s delight when we saw the coconut there! 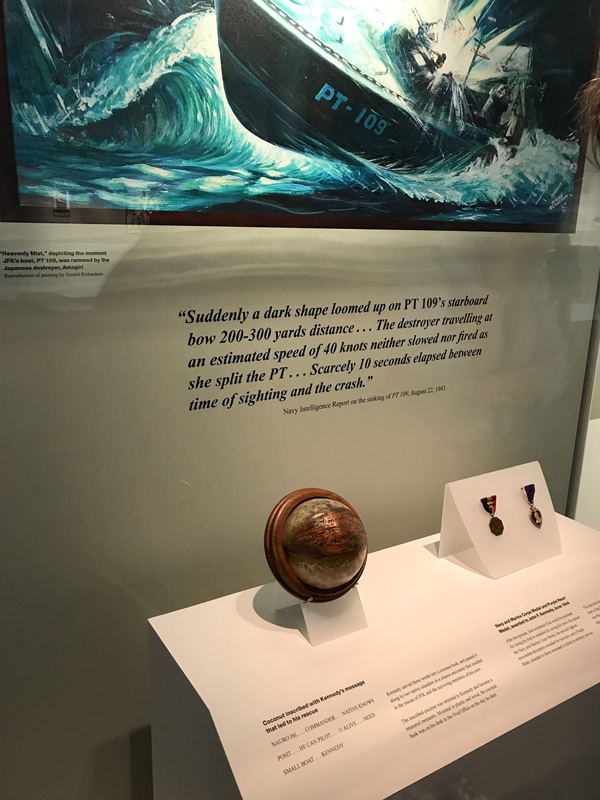 There was also John F. Kennedy’s Navy “dog tag” from World War II, which he wore with a St. Christopher’s Medal and an 1854 gold dollar coin given to him for good luck. 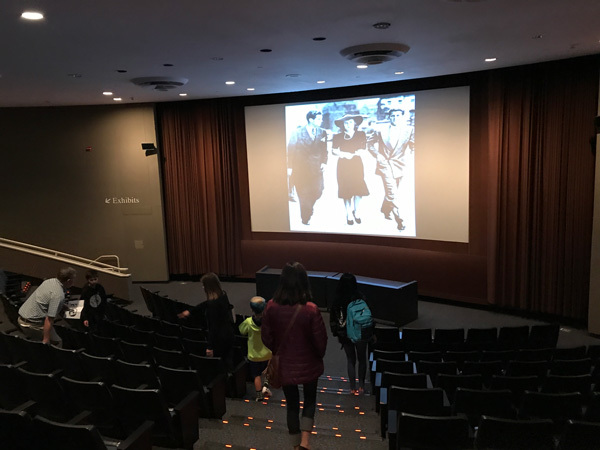 After we spent some time in the “Young Jack” Exhibit, we made our way into the theatre. 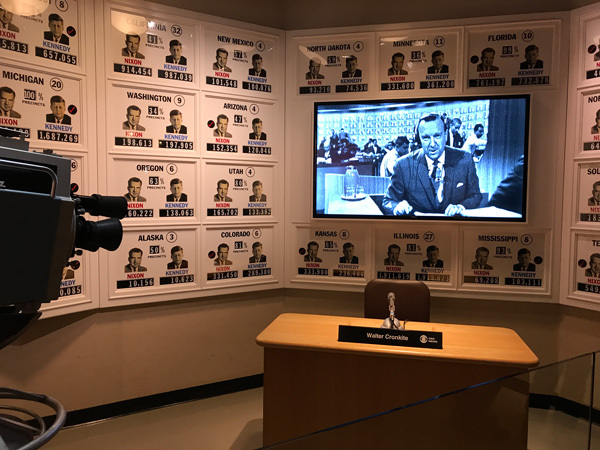 The theatre shows a 20 minute video that talks about the history up until Kennedy accepts the nomination in the Democratic Convention for the 1960 election. Once you exit the theatre you are brought to an exhibit that is set up like a street from Anytown, USA with various exhibits around the election. 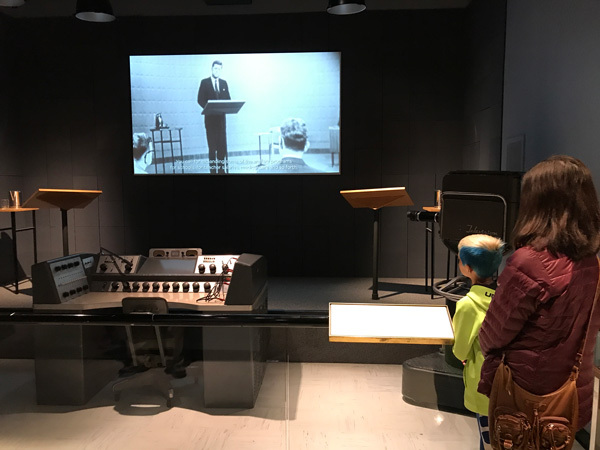 There is an exhibit that talks about the TV coverage on election night. And one on the famous televised debate with Richard Nixon. There’s also an exhibit on the campaign headquarters. 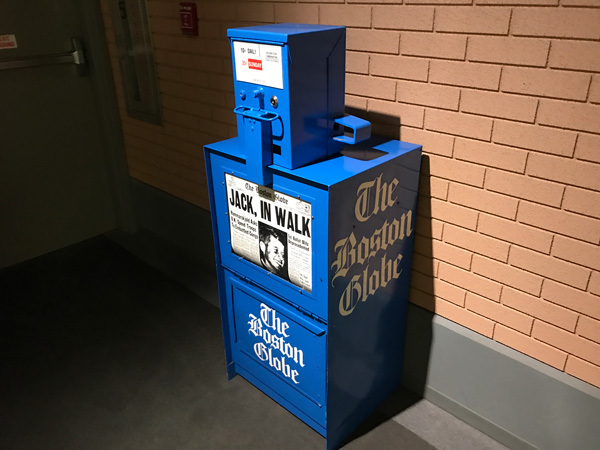 And newspaper stands along the “road”. 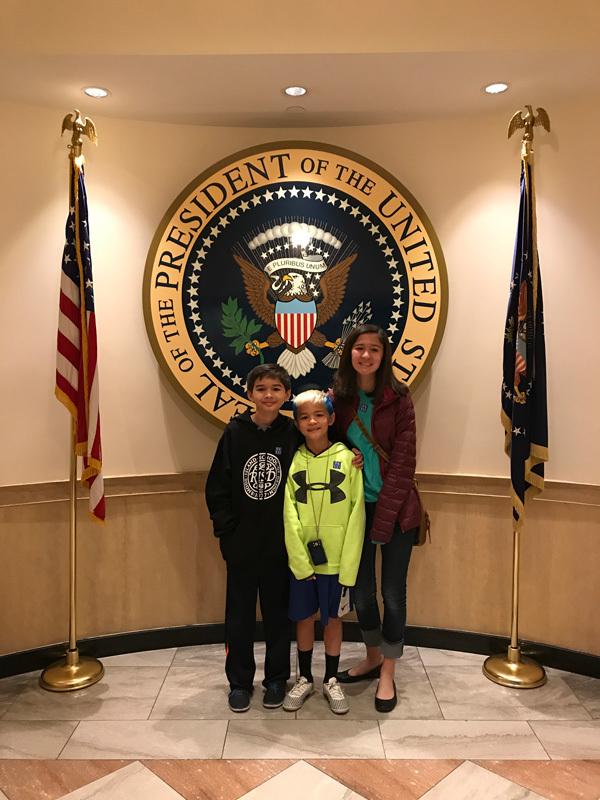 At the conclusion of that exhibit you are met with a huge Presidential Seal which of course I made the kids pose in front of! The next section talks about Kennedy’s (short) presidency and time in office. The exhibits are set up like you are inside the White House which I thought was pretty cool. Here is a list of all of the permanent exhibits in the Kennedy Library. 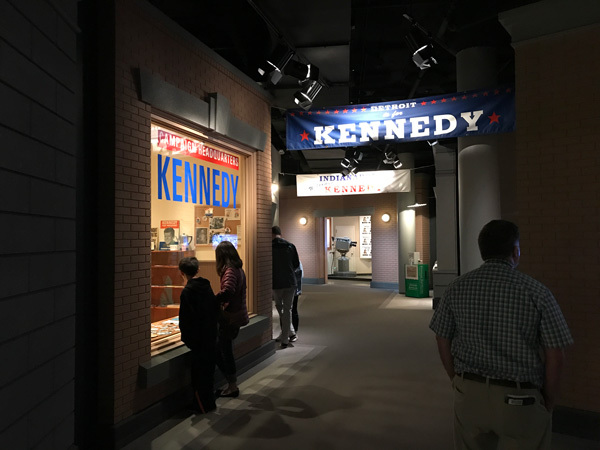 I didn’t take many pictures in this section because I was so consumed by the interesting artifacts and explanation of the impactful programs and events that Kennedy was involved in during his presidency. 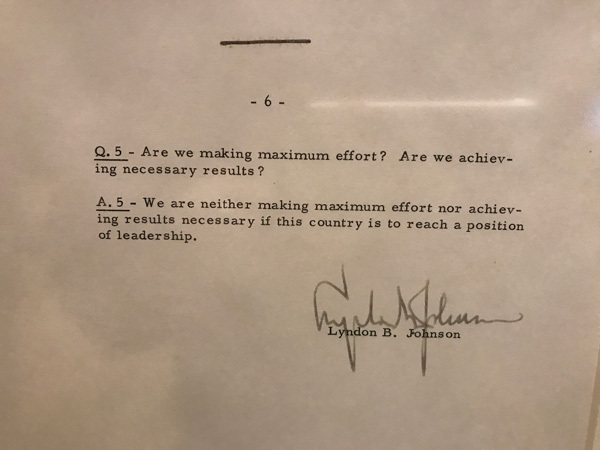 The thing I enjoyed most was this report that was written by Vice President Lyndon B. Johnson to Kennedy explaining the need to start pursuing a moon landing before the Russian superiority of their space programs outpaces us to a point where we cannot every hope to catch up. 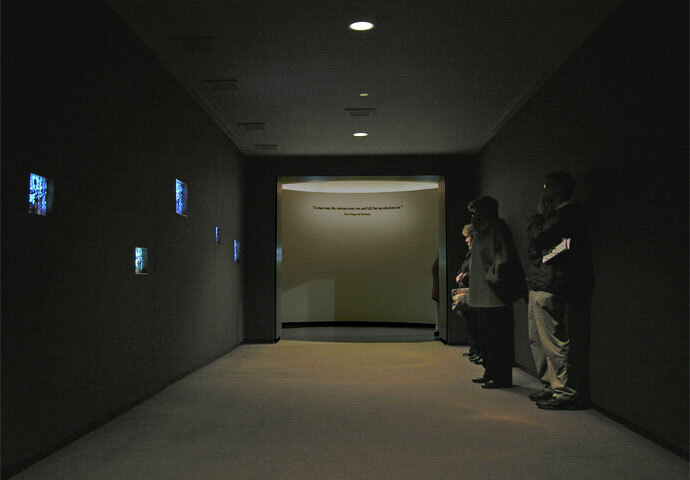 Following the White House section of the museum, there is a small and tasteful exhibit on the day Kennedy was assassinated. Then the visitor is led through a final section talking about his legacy including the Profiles in Courage Award that is presented annually to public servants who have made courageous decisions of conscience without regard for the personal or professional consequences. 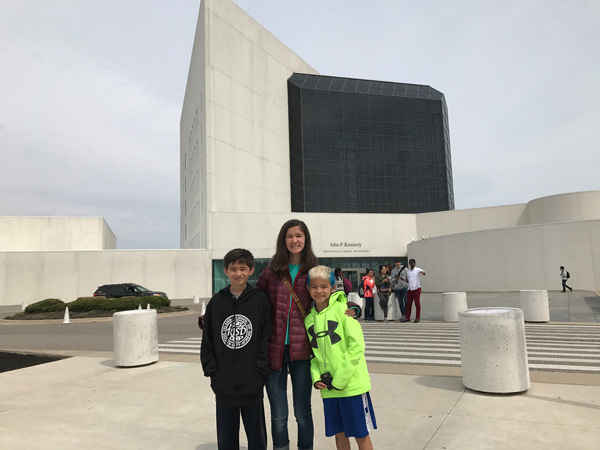 Our family’s visit to the John F. Kennedy Presidential Library was a great experience. All-in we spent about 2 hours there. 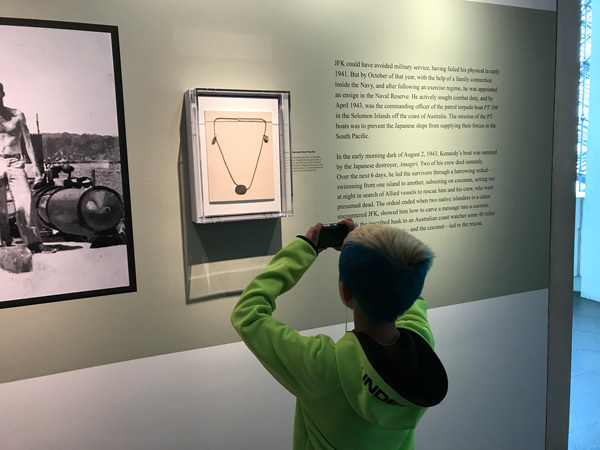 The admission cost was reasonable, the exhibits were engaging, and the artifacts were interesting. We all walked away with newfound education and appreciation for all that President Kennedy accomplished during his short presidency. 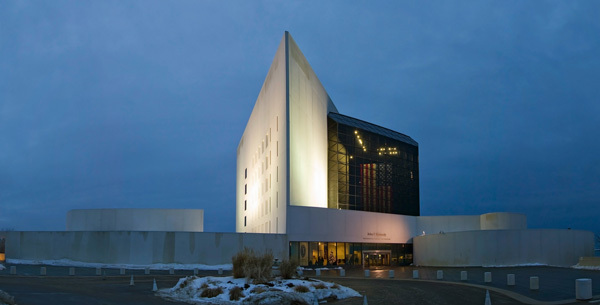 Have you visited the John F. Kennedy Presidential Library? Or have you visited any of the other Presdiential Libaries? Tell me about your experiences in the comments!